This circa-1917 news service photo of St. Louis Cardinals star pitcher, Bill Doak, was issued by the obscure Greely Photo Service of New York. Doak, who spent 12-and-a-half years of his 16 year career with the Cardinals, posted a lifetime won-loss record of 170-157, despite pitching for some pretty bad teams. In addition to the Cardinals he played for the Reds and Didgers. 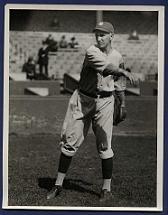 Interestingly, Doak was one of 17 pitchers who were allowed to throw a spitball fter it was outlawed in 1920. He pitched a few near-no-hitters in his career which was distinguished by 32 shutouts with the Cardinals alone. This 1918 photograph, which orginates from the famed Baseball Magazine archives, depicts a rookie Waite Hoyt before he ever threw a single major league pitch in his Hall of Fame career. 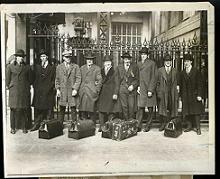 Hoyt is captured here, along with the entire New York Giants pitching staff, before boarding a Spring Training-bound train in New York City's Penn Station. He would go on to pitch in only one game with the Giants in 1918, striking out two batters in one inning of work. By 1919 he was on to the Boston Red Sox, where he hurled sporadically for two years, racking up only 10 wins and 16 losses in both years combined. Waite's next stop would be his most successful. In 1921 he landed in New York, once more, this time with the Yankees...and a Hall of Fame career was born. He would spend eight-and-a-half years with the Bronx Bombers, piling up an impressive 157 wins and 98 losses, putting way behind him his one inning of work in a Giants uniform in 1918. 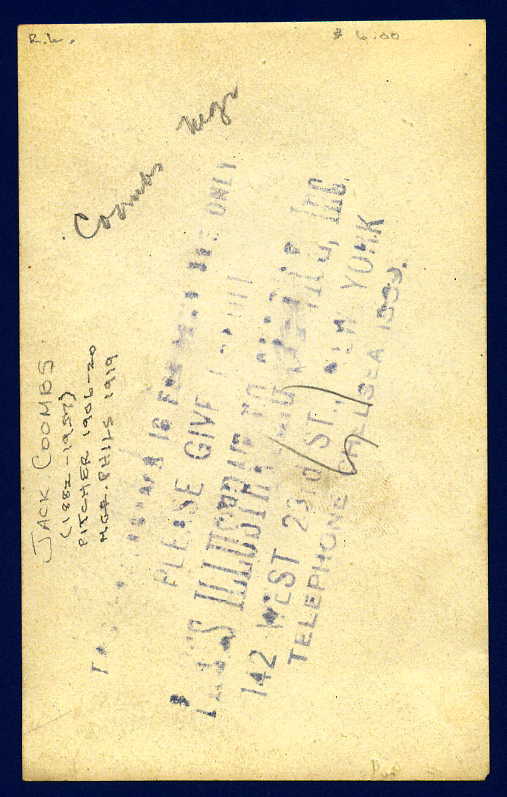 This Underwood & Underwood news service photo is graced by the Christie's hologram on its reverse, along with the U&U news stamp. Hoyt can be seen at far left sporting the freshest face of the Giants hurling crew in this pre-rookie photograph of the future HOFer. Other New York Giants seen here include Jeff Tesreau and Pol Perritt, who would combine for a 29-19 record as they led the Giants to a second place finish that year. When this picture was taken, no one depicted (including Hoyt) suspected Waite would not rise to stardom at the Polo Grounds, but on the other side of New York's Harlem River in the Bronx's Yankee Stadium. 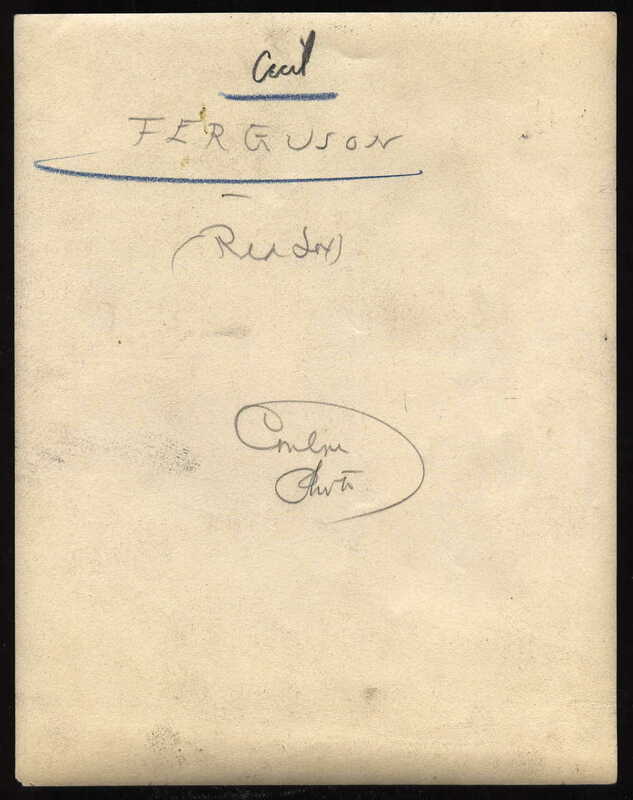 The subject of this Conlon photograph was identified on the reverse as "Ferguson" by photographer Charles Conlon. A later owner incorrectly added the first name, "Cecil." A Cecil Ferguson pitched for the NY Giants in 1905-06, yet wore a vastly different uniform, This c.1918 photo more likely depicts New York Yankee, Alex Ferguson, who played for the team in 1918, 1921 and 1925. Alex pitched for the Red Sox, Senators, Phillies and Didgers, as well, showcasing a forkball and losing more games than he won. In fact, in 1924, he had his best season, in which he led the league in losses with 17, but managed to win a career-high 14 games. During the 1925 season he pitched well enough to help the Senators win the A.L. 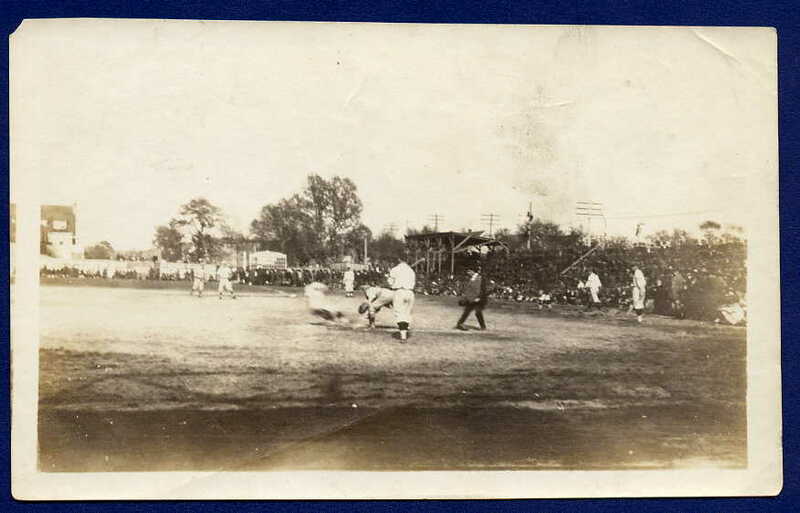 pennant and also pitched well during the team's losing World Series bid. 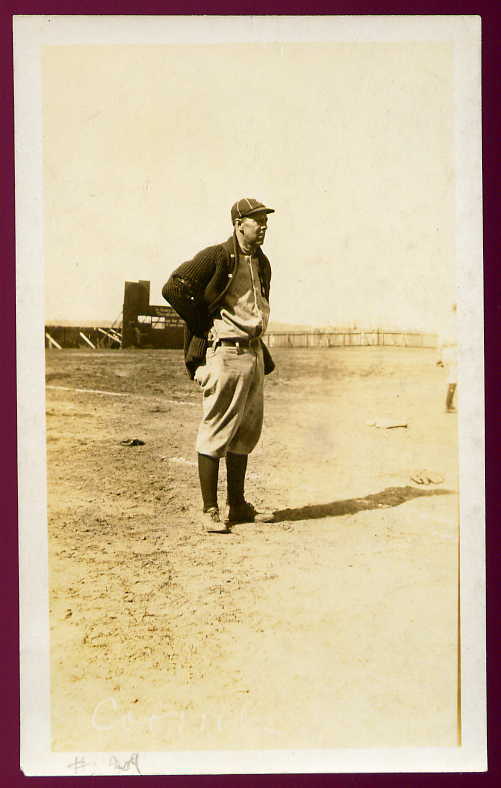 This postcard photograph was taken in 1919 and captures a pensive Jack Coombs, manager of the Philadelphia Phillies. 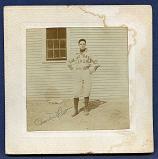 Coombs was a star pitcher from 1906 to 1913 for the Phillies' cross-town rivals, Connie Mack's A's. His best year was 1910 when he won 31 regular season games and 3 World series games against the Chicago Cubs. During the two yeasr before his Phillies managerial stint, Coombs pitched for the Brooklyn Dodgers. In 1920 he returned to the mound for the Detroit Tigers. He went on to coach at the college level, as well, for Princeton, Duke and Williams College and even authored an instructional book on the game (which can be seen in VintageBall's Memorabilia section). This stock image was distributed by a now forgotten New York-based photo service. 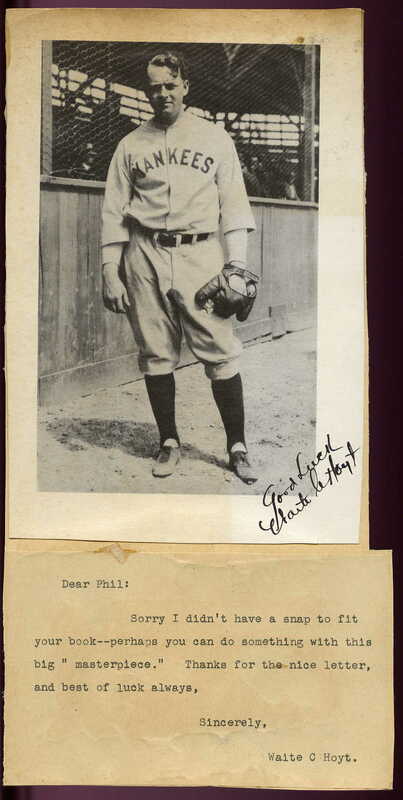 A truly amazing find, this autographed cabinet card depicts an extremely young Charlie Root before his days twirling for the Chicago Cubs. 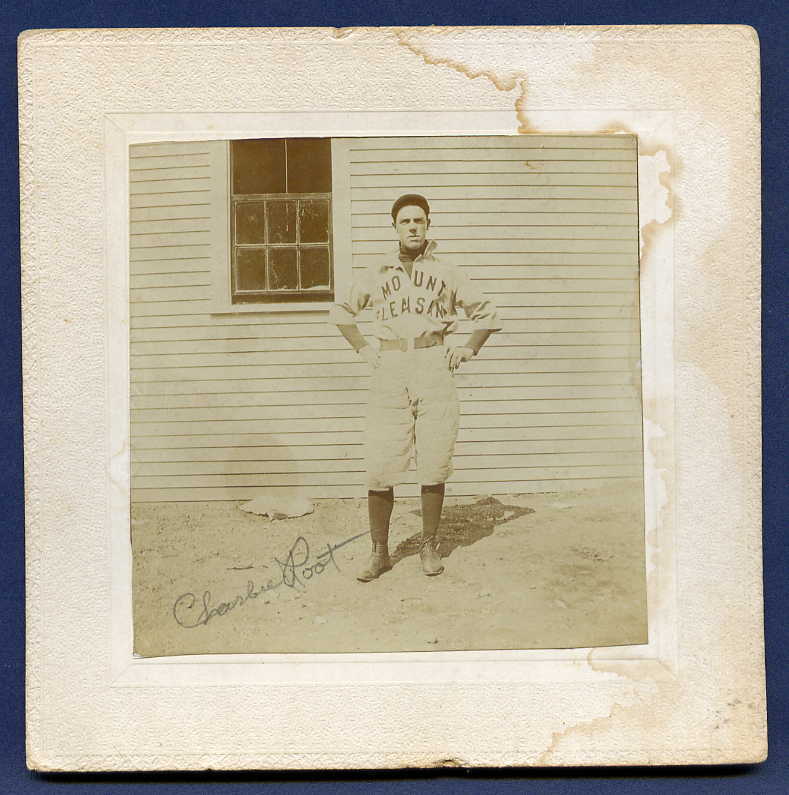 Despite the circa-1890s uniform pants he is wearing, this photo most likely was taken and printed in the late 1910s when he was pitching for a town or semi-pro team in "Mount Pleasant" (state unkown). Root, who went on to pitch for the 1923 St. Louis Browns and the 1924-25 Los Angeles Angels of the Pacific Coast League, would later become a star with the Chicago Cubs. He pitched for 16 years for the Cubs, amassing 201 wins in his big league career. However, he is best known for serving up Babe Ruth's infamous "called Shot" during the 1932 World Series. After his MLB playing career he became a coach in the PCL and later for the Cubs and Braves. 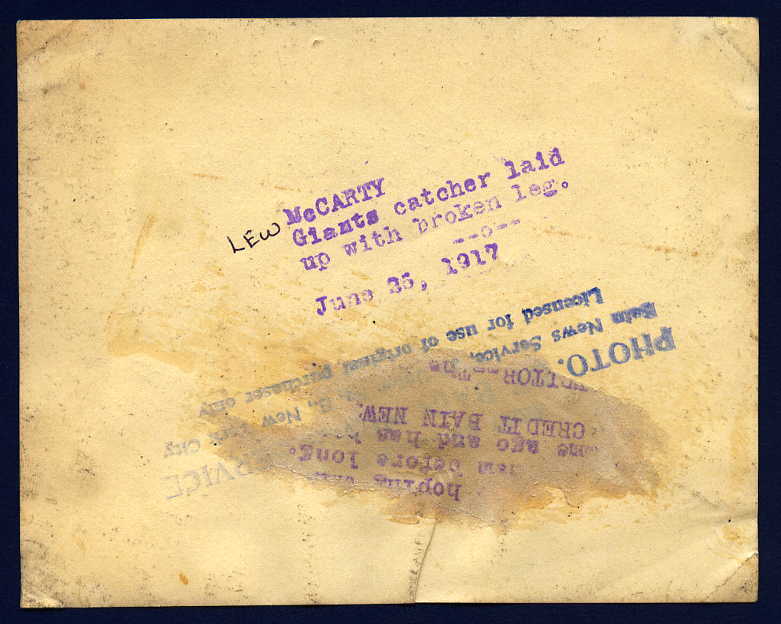 One of the rarest news service stamps graces the back og this 1917 photograph of Giants catcher, Lew McCarty. 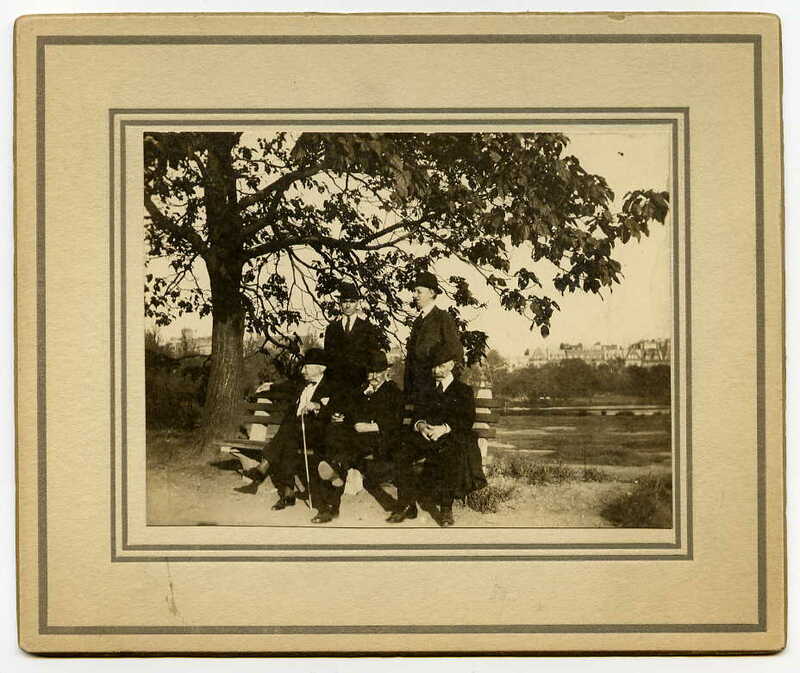 This photo was released by the Bain News Service, which was responsible for circulating the work of New York photographer, George Bain. This circa-1917 news service photo of St. Louis Cardinals star pitcher, Bill Doak, was issued by the obscure Greely Photo Service of New York. 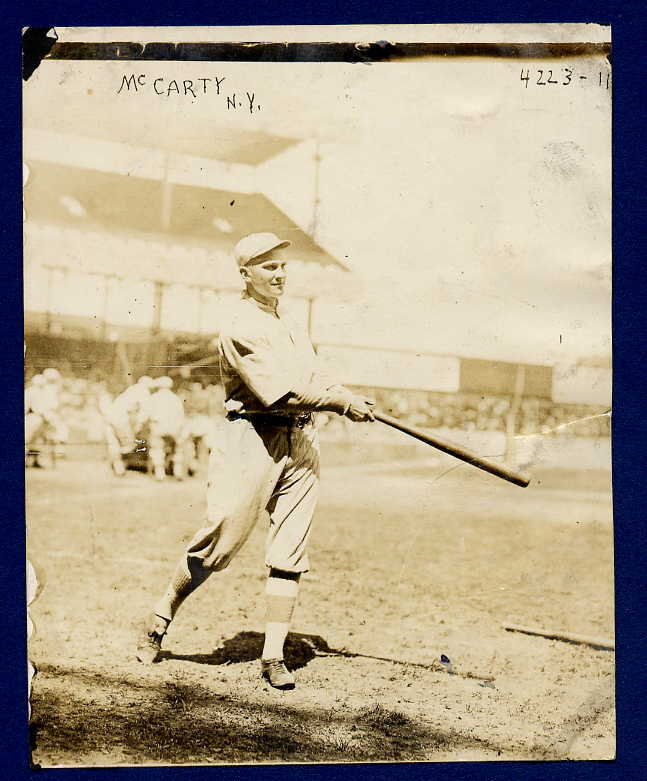 McCarty, who played for nine years in the majors for the Giants, Dodgers and Cardinals holds the distinction of being traded to the Giants for firstbaseman, Fred Merkle, in 1916. At right, is a terrific autographed image of Hoyt with the Yankees, captured sometime between 1927 and 1930. This picture depicts Hoyt wearing the curious Yankees road uniform of the period, without the words "New York" on the jersey. 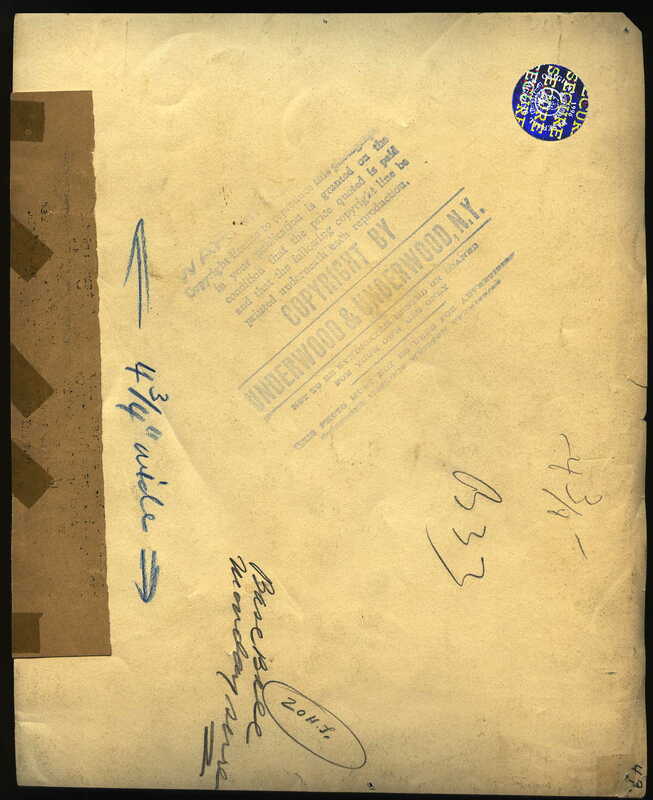 Waite has autographed the picture with his full name -- "Waite C. Hoyt" -- and has apended a typed note in response to a request. This photograph and the related correspondence are attached to scrapbook paper and offer a wonderful glimpse of how the sharp-tongued Hoyt could be most gracious when dealing with reporters and fans. 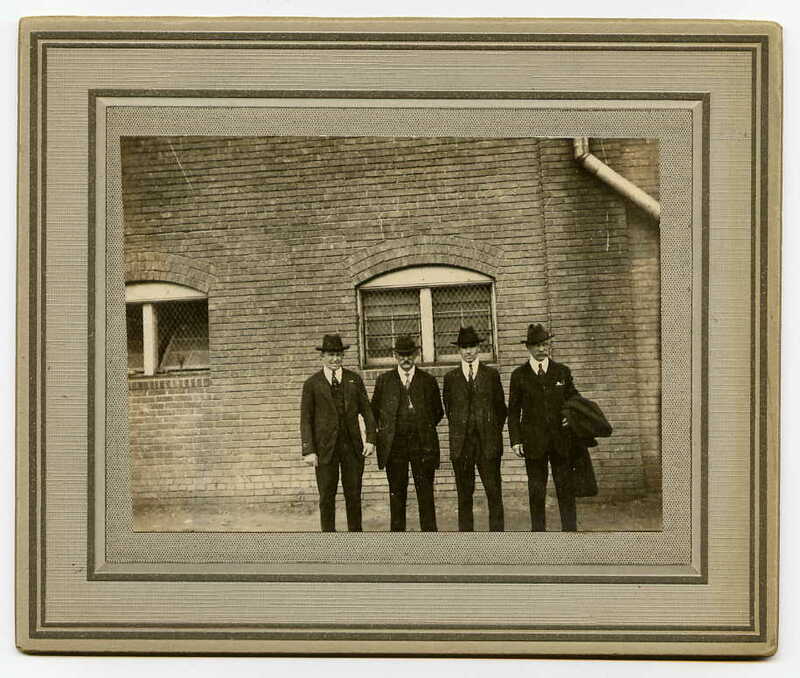 These four cabinet cards are identified on the reverse as having been taken during the 1918 World Series in Boston. Indeed, the image at upper left was taken outside of Fenway Park, itself. Depicted in all the photographs are several of five unidentified executives, supposedly league and/or team officials enjoying post-season festivities during the World Series between the Red Sox and Cubs. 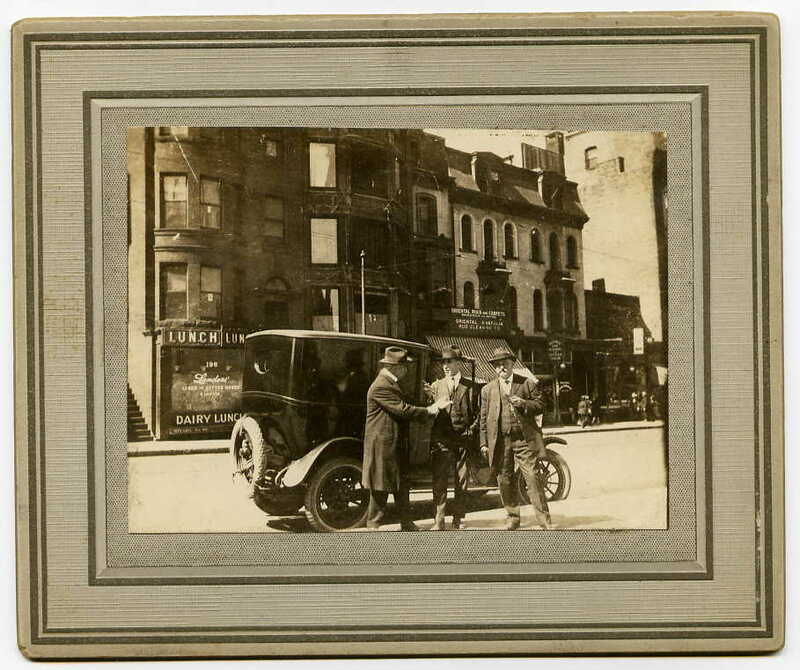 The suited men are pictured at the ballpark, on the street, exiting a period automobile, in a park and on the street. 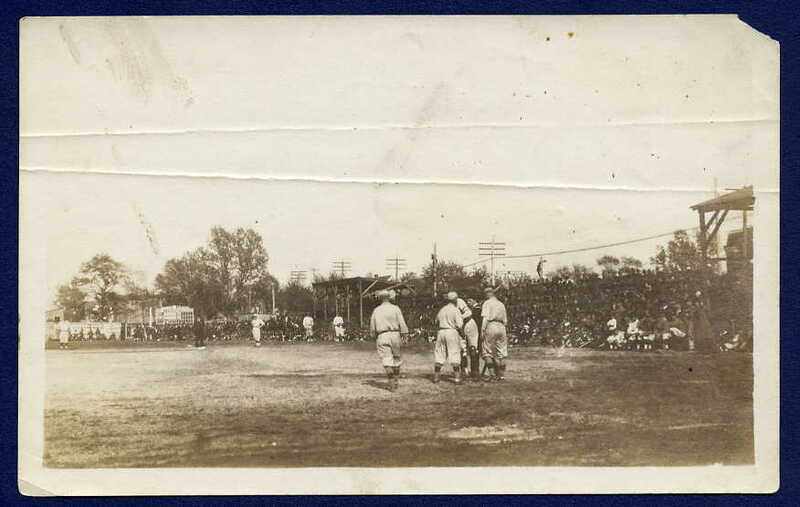 These four postcard-sized photographs capture a fascinating period in baseball and American history. 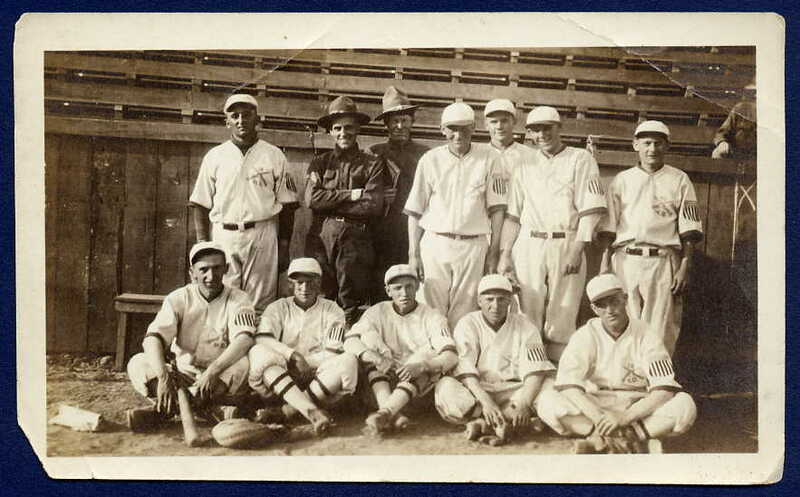 These images depict wartime baseball among the troops during the First World War. 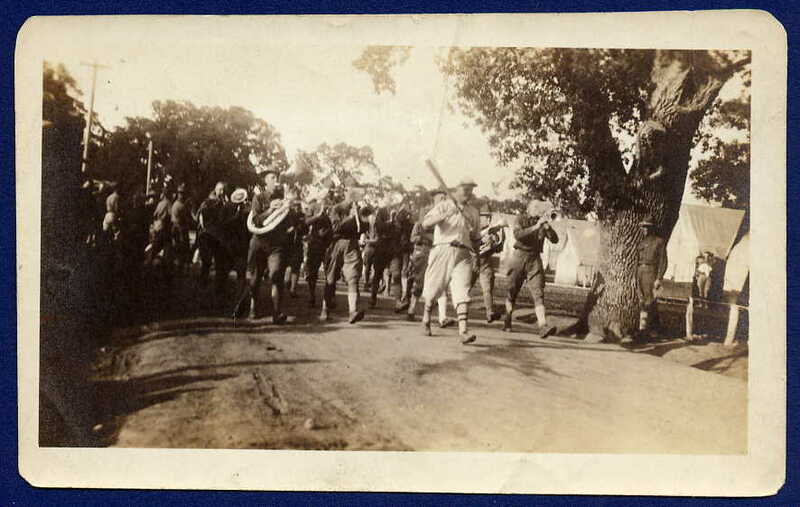 They show a posed team picture as well as in-action shots...and even a parade being led by a ballplayer with his bat hoisted atop his shoulder like a rifle. 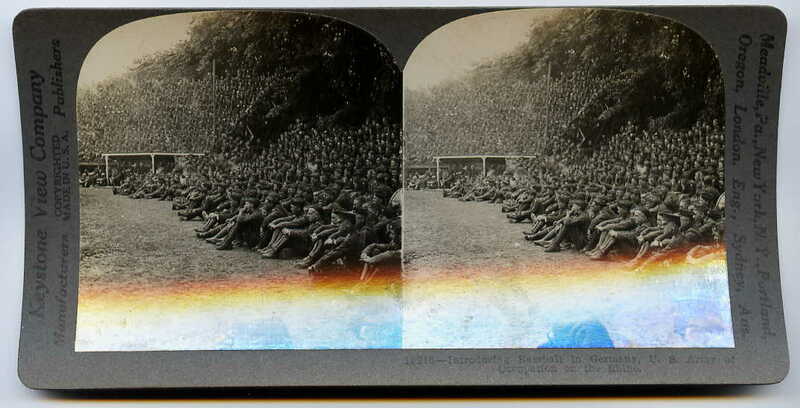 Additionally, below, is a late stereoview of U.S. troops "introducing baseball in Germany" during the "U.S. Army Occupation on the Rhine." 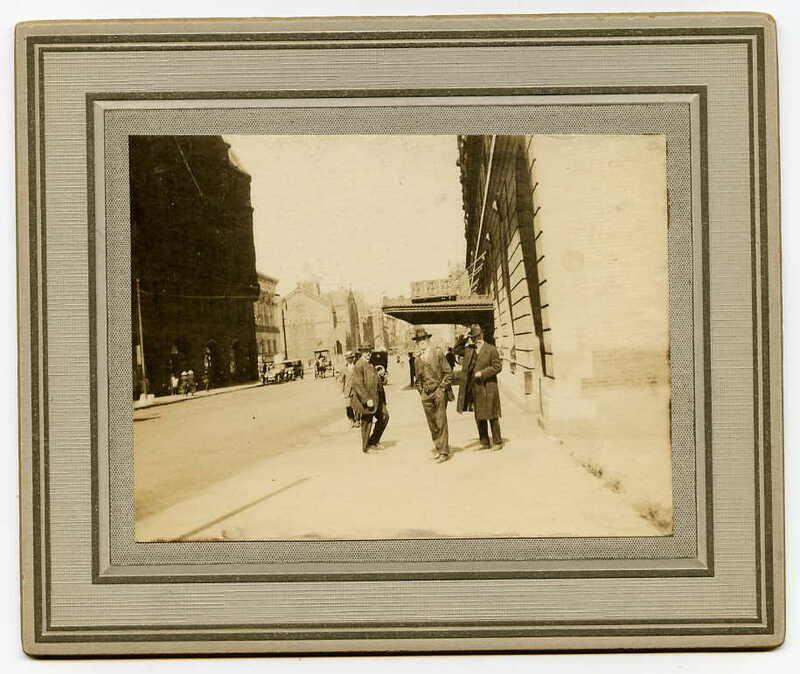 This stereoptic card was produced by the Keystone View Company, a leader in stereo cards and press photographs.